I’ve mentioned it on the blog a few times before, so I’m sure you’re all familiar with the Hearth & Blade (formerly Yavmir) campaign setting that I’ve been working on with my brother over the last few years. We hit a pretty big milestone on the project this week with the completion of the bestiary: a collection of monsters specifically designed for the setting. As with all things related to Hearth & Blade, these creatures are primarily inspired by Slavic folkore and are built for the Pathfinder RPG using the P6 mod. 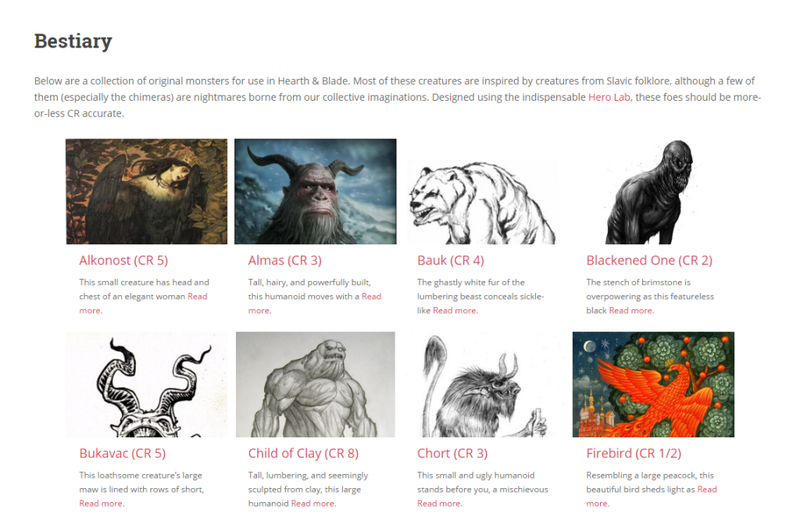 In addition to the monsters rooted in myth, we added some creatures of our own invention: including some fiendish chimeras and terrifying undead. Spooky! Additionally, we’ve supplemented our original creations with a collection of Pathfinder monsters. These entries are all from Bestiary I, which aligns with are “core only” approach to game design. We hope the addition of these collections of beasts will bring the setting closer to becoming completely playable!